Well, as you know we made it here to New Zealand. Here’s a quick look at the statistics for our 2018 Journey. 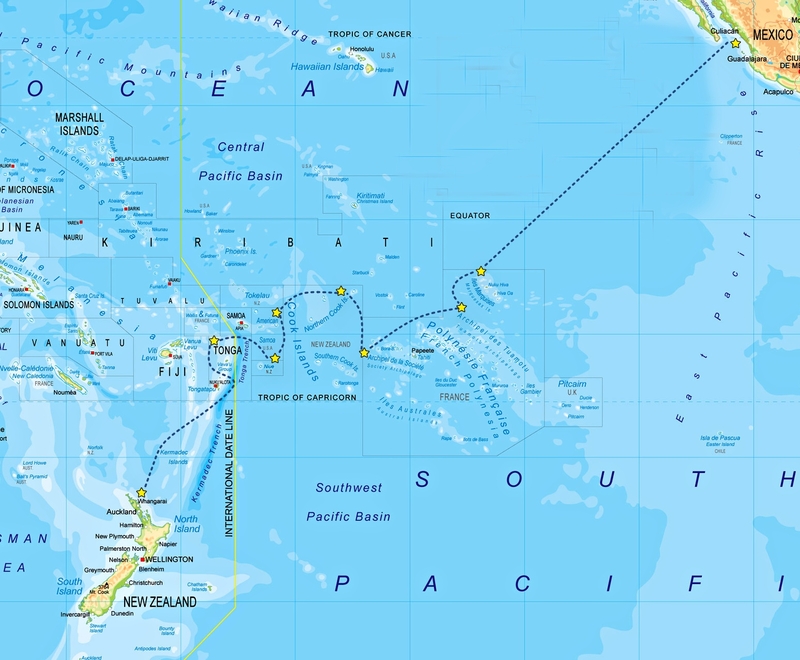 We left Banderas Bay, México on March 25th, 2018 and traveled just over 3100 NM to Hiva Oa, Marquesas in French Polynesia arriving on April 19th, 2018. The entire trip took 25 days. Yes, it was a whirlwind year where many great memories and friends were made! Can’t wait to see what awaits us in 2019. Suwarrow! The Jewel Of The Cooks! Our passage from Bora Bora to Suwarrow was relatively uneventful. We had several days of great sailing but during the final two the winds died and we had to fire up the iron genny. We arrived at the pass around 0800 and our entrance went perfectly. That’s always a blessing. Ever since Fakarava I still hold my breath as we get ready to go through a pass but Dan has proven over and over that he has a handle on the timing these days. We’re pretty certain if you look up “majestic” in the dictionary it says… “See Suwarrow!” This ranks right up there with Maupiti as one of our favorite destinations so far. The rangers, Harry & John, were an absolute delight to get to know. The Cook Islanders should consider themselves blessed to have such amazing ambassadors. They represent their country well. One thing to know about Suwarrow is that it is only inhabited from April through the end of October. That’s when the Rangers are there. They get dropped off with six months of supplies and hope to be picked up by the start of cyclone season in November. We say hope because in 2017 they were essentially forgotten. This could have ended in disaster as cyclones can completely wash over the atoll. Fortunately for Harry & John they were able to hitch a ride with one of the last cruiser boats leaving the atoll. You can only get to Suwarrow via private yacht or charter so getting the chance to visit this amazing place was just awesome! When we arrived there were just a dozen other sailboats in the anchorage. This made for wonderful and peaceful stay in paradise. One day we went snorkeling near the edge of the atoll. The water was so clear you could easily see 150-200 feet away. Dan caught a glimpse a five foot grey shark. I missed it but the other fish were beautiful and the coral itself is in amazing shape. Unfortunately we’ve seen a lot of dead coral in our travels in the Tuamotus and further west. You can tell they take great care to protect this perfect gem. Another day we went on an exploratory adventure in the dink. We traveled all around the reef on the northwest side of the atoll. The water was flat & calm and the sun was shining bright so we had unbelievable visibility in the water. We made our way down to a motu and decided to pull the dink ashore. We had to get out and pull it through some very shallow water…6” or so. As we started walking we noticed several baby black tip sharks swimming around. The splashing of our feet in the water undoubtedly attracted them. No worries…all we had to do was splash toward them and they darted away. This motu was at a point in the atoll where the ocean comes over the reef so there is sort of channel there. It’s not deep enough to drive a boat through, even the dink, but it does have quite a bit of current. As I was walking along the shoreline I came upon a very disheartening sight. In a stretch of about thirty yards the beach was literally covered with plastic garbage. Most of it was bottle caps from plastic soda bottles. I was horrified at seeing this on this most perfect beach so I went back to the dink, grabbed a garbage bag and began picking up all the trash. In the span of about five minutes I picked up 64 plastic bottle caps!!! In addition to that there was a plastic tube that once held caulking, a dozen or so plastic bottles, plastic lids for five gallon buckets, a plastic bag, and several other pieces of plastic. It was very sad to see all of this trash collecting on a beach that is literally hundreds of miles away from anything. It made me wonder how far this stuff traveled across the ocean to get here. It was very sad! On a lighter note we did get to witness nature in action a bit later. We were slowly creeping along the reef near the shore just checking things out when we saw a fish swimming at the top of the water. At first we thought it might be a puffer fish so I told Dan to go back so I could get some video. As we got nearer to the fish we saw about a three foot black tip shark swimming around the fish. He had already taken a bite out of it, which is why it was at the top of the water. As we approached the shark got spooked and darted around the dink. He came up on the other side and went back to his prey. Within seconds he chomped down on the fish and took off. Apparently he thought we might be trying to take his dinner. It was pretty cool and we got it all on video! Later in the day we went to shore to hang out with some of the other cruisers. Before we bunched up with them we walked to the other side of the motu to what the rangers call Shark Bay. Within seconds of stepping into the water we knew exactly why it’s called that. We literally saw a least a dozen or more sharks swimming near the beach. They weren’t huge by any stretch. The largest was a grey shark about four and a half feet. The rest were in the 2-3 1/2 foot range. Most of them were black tips but there were a couple of greys and a white tip. They literally surfed the waves right into the beach into water that was four to six inches deep. It was absolutely awesome! They were coming right up to us. Of course once we saw them we stepped back toward the beach so they couldn’t get to us. Later Harry told us that is where they clean their fish and get rid of some of their food. He said the shark are like dogs. You can almost call out and get them to come up to the beach. He’s even seen them almost beach themselves trying to get close to them when they were throwing out food. What a sight it was to see. As the sun started to get lower we walked back to the anchorage side of the motu. This motu is completely covered with hermit crabs. As it gets darker you literally see the beach come alive. It’s like the entire surface is moving. I am not exaggerating to say down the one path from the ranger station/housing to the picnic area we saw close to a thousand of these things. It was amazing!!! 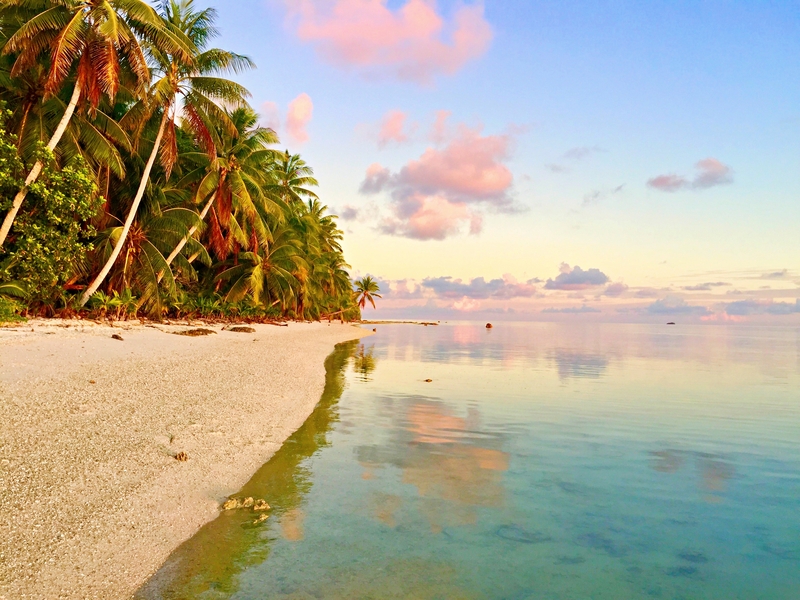 This atoll has certainly provided us with a lot of wildlife experiences to be sure. We made our way back to the beach where several other cruisers were sitting around the table chatting. They had all just finished learning how to weave a basket out of palm fronds. Ranger John taught the class. Dan brought his ukulele to shore and gave a little concert for everyone. We all had our sundowners and were just enjoying the music, fellowship and amazing sunset. When I say amazing I mean it. The water was so flat that at one point you couldn’t tell where the water ended and the sky began. What great way to end a day. We awoke on our final day and got ready to make passage. Before we could leave, however, Dan had to get his dive gear on and help SV Maia to get their anchor unfouled. They anchored in about 85 feet of water and were wrapped all up in the bommies. This anchorage is known for its bommie fields. My amazing man, Captain Save-A-Hoe, came to the rescue again. It took him almost an hour to get their anchor chain unwrapped. He had to make three short 85′ dives to the bottom to get them free but he did it. Six boats left the anchorage the day we left and Dazzler and one other boat were the only ones who didn’t have trouble getting their anchors up. Everyone was just gawking at us as we smoothly raised our anchor and cruised out of the anchorage. Yep….we looked like professionals. Of course all good things must end and so it was with immense sadness that we said goodbye to Harry & John and the mystical and magical place known as Suwarrow. Three days was clearly not enough time to really enjoy all there was to see there but alas we had parts arriving in American Samoa at the end of the week and we had to move on. So, we departed the anchorage for the 80 mile journey to Pago Pago. CLICK HERE TO SEE A VIDEO OF OUR TRIP TO SUWARROW!